It all started with a small turtle. A turtle who was destined for greatness, but was it aware of this upon delving into the great blue? Not really. It simply wanted to make a splish and a splash, go on a swimming adventure as it were. Rather fortunate that it did however, as had it simply remained on the beach of its birth, this part of Sango – Tales from the Coral Cave would likely have had a much different ending. Actually, the above is not quite right as the game begins with a kid on a beach, one deeply immersed in his coloring book, creating wondrous art. The whole turtle bit didn’t come into play (get it?) until I clicked around a bit, discovering that this is indeed a tale of two halves, the first of which I shall chronicle in this very article: The Village of Crabs! 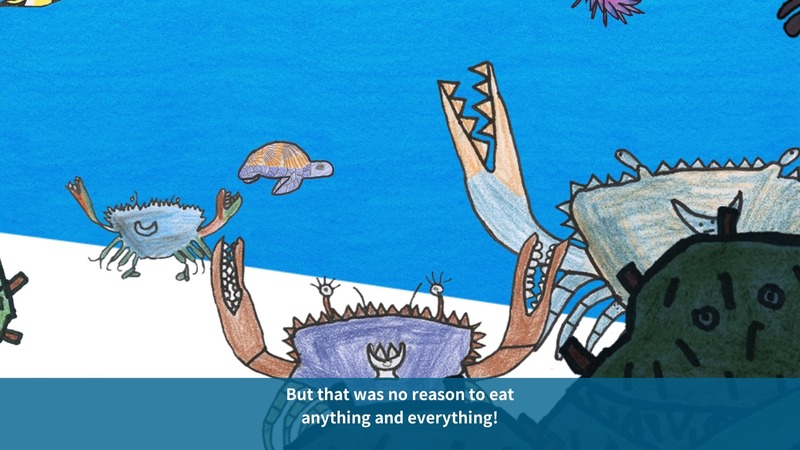 Didn’t really have much to do with crabs at first glance though, because as I mentioned a couple paragraphs back, the protagonist is a turtle… and there were certainly no crabs in sight. Or other sea creatures, for that matter. Just said turtle, palm trees and a sandy beach. That said, everything did look absolutely incredible, to the point where you’d likely think me lying, were I to claim this game was created from drawings made by 10 year old children. It was though, according to the credits I was treated to after finishing The Village of Crabs. As I pointed and clicked, the turtle unsurprisingly moved very slowly across the screen, a narrator revealing its desire to dive into the sea. A seemingly simple task, seeing how the ocean was right there, but a brief crawl away (if not for the fact that turtles will be turtles, slow and all). Given the choice, our shelled protagonist would certainly have simply jumped right in, not a care in the world. But as I’m sure you can imagine, that would not make for much of an adventure. So, by a little girl overlooking the shore, a request was made to the turtle: bring her brother back. Her brother who, for some reason, lives with the crabs at the bottom of the sea. Did I mention how this entire experience was created by children, and how the imagination of a child is absolutely wondrous? Almost makes me miss being those days. Anyway, onwards the turtle went, still thinking of what the girl had asked of her, upon finally reaching the cool water. From this point onwards the story – which I shall spoil no more of – got a tad silly, although the puzzles, however odd they may have seemed at first, did eventually make sense. As soon as I started paying close attention to my surroundings that is, noticing things I’d missed earlier. That’s just what happens when you’re a turtle on a mission in such a colorful game though, and I’m also going to blame it on her prioritizing wanting to simply enjoy life… under the sea. Now, while the journey wasn’t of great length, clocking in at around fifteen minutes, it was still an absolute joy and a very easy recommendation. As for why I didn’t give the other tale a go, well, that would have delayed the publication of what you’re currently reading, and I wanted to get word out as soon as possible! I’m sure you’ll understand after playing Sango – Tales from the Coral Cave.